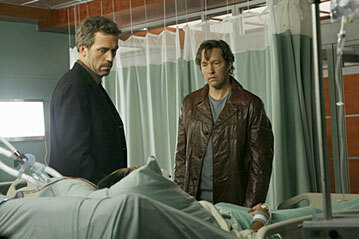 House MD Episode Guide: Season Two #223 "Who's Your Daddy?" Second Season Episodes :: #223 "Who's Your Daddy?" so after reading the ones below, click on the "Search" button above to search for "223". House (Hugh Laurie) treats the daughter of a friend in the HOUSE episode "Who's Your Daddy?" airing Tuesday, May 16 (9:00-10:00 PM ET/PT) on FOX. A 16 year old girl, Leona, presenting with cardiogenic shock. But no heart attack. The girl (the granddaughter of jazz legend Jesse Baker), who is having flashbacks to Katrina has told Dylan Crandall, an old band mate of House's, that she has just discovered that she is Crandall's daughter. His pain has become overbearing and he decides he needs morphine but Cuddy calls just before he injects himself and tells him of the "cardiogenic shock but no heart attack". The cause a heart attack while trying to find the part of her heart causing hallucinations. After they find the right part and freeze it, the patient has another hallucination. House tries to explain this because "If she did have a hallucination then the heart problem that we predicted, found and fixed was just a gigantic coincidence. They later decide it is an autoimmune condition and they start a irradiation process so they can do a bone marrow transplant (fortunately they are able to stop this in time because it turns out that is also wrong). Then House orders a dangerous liver biopsy but then stops it just in time. Then Hemochromatosis (turns out to be true but not the whole problem and treating it destroys her lungs). Then they decides she has a fungus - but which one? House promises that he won't run a paternity test but he does. But then he lies to them telling them that they are father and daughter when they really aren't. (House tells Crandall they are now even.) And in addition, House tracks down one of the donors Cuddy is considering and introduces him to her so that she knows who he is. Zygomycosis: grows on soundproofing material when it gets really moist (Katrina like moist) at the highest levels of mold. Toddler whose chest is all red - turns out the family has a new red couch which he lies on after his bath. House reaches for a stash of morphine that he had at the top of a bookcase. He gets called in for the case just before injecting himself. But at the end we see that he has done so. House's answering machine message says (in his voice), "You've reached a number which has been disconnected and is no longer in service. If you feel you've reached this recording in error, go with it, hang up. On three: One, two—" (the beep comes where three would have been). Dylan Crandall is a close enough friend of House's to know to pretend to hug him without ever touching him. Crandall gets away with nicknaming House as "G-man". Throughout the episode House first says, "She'll be fine by breakfast." Then "She'll be fine by lunch. See, I was wrong before about the breakfast." And at the end, "She be fine by [pause] dinner." Cuddy is studying the files of sperm donors for her attempt at in vitro fertilization. The masseuse from "Detox" returns. (guest star D.B. Sweeney) in the HOUSE episode "Who's Your Daddy?" airing Tuesday, May 16 (9:00-10:00 PM ET/PT) on FOX. An Analysis of the medicine in the episode from "Polite Dissent". Guest Cast: D.B. Sweeney as Crandall; Aasha Davis as Leona; Christopher Carley as John Linehan; Tuffet Schmelzle as Young Mother; Owen Pearce as Max; America Olivo as Ingrid; Krista Lewis as Flight Attendant. Cameron: "How do you test someone's response to pain." Cameron: "She's lost everything and you're breaking fingers. A new low." House: "Diagnostically she needed to be hurt. I wanted to hurt her. Win-win. What I didn't consider was the threshold to trigger the hallucinations. Otherwise, I'd have done the finger=bending first instead of stabbing her twice. That was cruel. House: "How does someone who believes absolutely anything become a non-fiction writer?" Crandall (refusing to have a paternity test done): "...If our friendship means anything to you." House: "Come on. Do you know me at all?" Wilson: "So, why were you friends with this guy?" House: "We were 20 years old. He had a car. If he'd been a woman, I would have married him." Wilson, asking about Crandall and the girl who is supposed to be his daughter: "Is he a match?" House: "No. Lying girl lucked out. We found one in the registry." Wilson: "Is he the dad?" House: "I don't think so." Wilson: "You didn't run the test?" Wilson: "Okay. So either you lied or he has pictures of you being?" Wilson: "I find it very comforting. You defending a man you haven't seen in years. To know my friend, no matter what you'll always be my champion. My protector—"
House: "I'm not protecting him, I'm smacking her." Wilson: "The modesty of a true hero." House: "Push me and I'll let her die just so you'll stop annoying me." Wilson: "Here's my theory. You're jealous. He's maturing. he's accepting responsibility, you're emotionally stuck at 17." House: "He's manufacturing responsibility, he's not maturing. He hasn't changed at all." Wilson: "So then why do you care?" 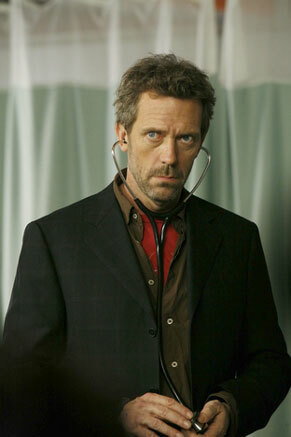 [House tells Wilson about the black ooze they saw in the patient.] "You're trying to end this conversation by grossing me out? I'm an oncologist. Half my patients have the skin sloughing off. Why are you so worried about this guy?" House: "He was having a rough time with his girlfriend. He was in love. He was always in love. Wanted to marry her. I thought she was flaky. She was sending mixed signals. Wilson: "So. you gave him advice and she dumped him." House: "No. I told him that I would talk to her." Wilson: "And you blew it?" House: "Technically—" [House makes a turn around hand gesture.] "I was doing him a favor. She was nuts." As a reward for his honesty and perhaps in a bit of disgust, Wilson gives House the rest of his specially prepared lunch. House: "We developed a theory. Hemochromatosis. Like good scientists we tested that theory. We proved that theory. We acted based on that proof and we treated her. As a result of which she is on the verge of death. Is it just me or have we discovered a flaw in the scientific method? Walk me through it step by step. What is supposed to happen when you give someone deferoxamine?" House to Cuddy on how she is choosing her baby's father: "Genes matter. Who you are matters. Find somebody you trust."